When it comes to boxing mantras, call it the flavor of the month. A fighter foregoes a by all accounts easier match to call out the most daunting commodity in a given weight class – in spite of consensus opinion that his competitive fate is all but sealed. The 32-year-old Brit with Pakistani roots is just 18 days from an initiation under the lights at Madison Square Garden, where he’ll face unbeaten WBO welterweight champ – and heavy favorite – Terence Crawford atop a star-sopped PPV card that’s being promoted by Top Rank and broadcast by ESPN. Khan’s quest comes on the heels of lightweight champ Mikey Garcia’s challenge of Crawford’s fellow 147-pound boss, Errol Spence Jr., in front of a big crowd at the home of the NFL’s Dallas Cowboys. Garcia lost nearly every minute of every round to the IBF’s king at 147, and many forecast a similar – if not more violent – evening for Khan, who’s been stopped in three of four losses across a hype-filled pro career that began about a year after an Olympic silver medal and five months before his 19th birthday. Nevertheless, Khan, now 32, still feels the draw of would-be immortality, powerfully enough to dismiss a chance to duel domestic rival – and former Spence victim – Kell Brook. “I want to be in the biggest fights ever,” he said. “I’ve been in the big fights previously and I’ve won them. I’ve lost some as well, but the thing is I’ve always been in big fights and I’ve always belonged in the big fights. I want to be remembered as one of those fighters who fought against the best, regardless, win or lose. This is another opportunity for me. “I could have taken an easier route and fought someone like Kell Brook and beaten him quite easily. But I thought, ‘No, this is for another world title. It’s gonna establish my name as a bigger name if I win this fight.’ And when I win this fight it’s gonna make me a bigger name than I am, and also put me in the history books as one of the best fighters to ever come out of Britain. Lest anyone forget, it’s not Khan’s first bite at the historical apple. He’d strung together four straight wins as a full-time welterweight through 2015, when, after nearly a full year on the shelf, he skipped over a weight division to challenge WBC middleweight champ Canelo Alvarez in an HBO PPV show at the T-Mobile Arena in Las Vegas. A slick, dynamic Khan was ahead on one scorecard and within a point on another entering the sixth round, when a single right hand robbed his consciousness and ended his pursuit at 2:37 of the session. He spent two years in career rebuild mode this time, before returning to record victories over welterweight gatekeepers Phil Lo Greco (TKO 1) and Samuel Vargas (UD 12) in April and September of 2018. 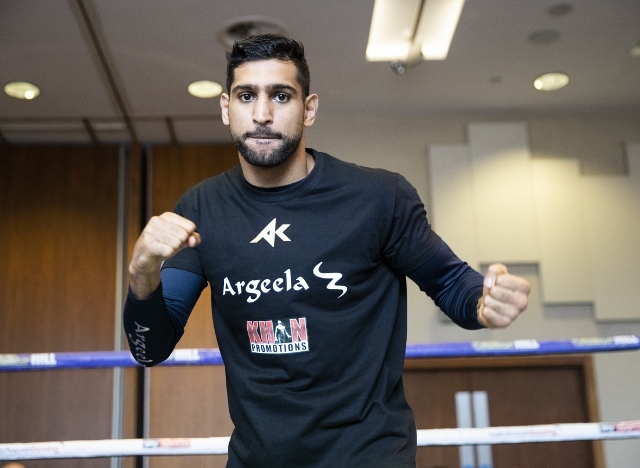 Previous rebuilds had been necessary after losses to Breidis Prescott in 2008, followed by Lamont Peterson and Danny Garcia in 2011 and 2012, respectively, but Khan insists his faith has never wavered. “I think it’s how you are as a fighter yourself. I believe in myself,” he said. BoxingScene.com caught up with Khan to talk about the final few weeks of preparation for Crawford, the elements of the fight that people viewing the champion as prohibitive might be missing, and the things people will see in the early stages on fight night that’ll start changing their mindsets. BoxingScene.com: Talk about where you are at this point. The fight is about three weeks out. What’s your process like at this point? Walk me through the next 20 days before fight night. Amir Khan: We’re just sharpening up now, just peaking. I’m at the position where my body’s now getting stronger, getting better and we’re at the peak of the conditioning and then I’ll start tapering. The next 10 days is another hard, hard week and then we’ll start tapering. But everything’s going really well, lots of sparring, great sparring work. Lots of rounds of sparring. Mitt work with Virgil. Lots of conditioning work involved. Lots of running and fitness work. So everything is perfect, we’re where we need to be. I’m very happy with the way the camp’s gone and hopefully we can finish off strongly. BoxingScene.com: We all blink our eyes and Amir Khan’s been around a while. Seems like just yesterday you were a teenage kid. You’ve been through what feels like a million fights. Big, small, different places. Does this one feel different or mean different things to you than some of the other big ones like Garcia, Canelo or some of the other ones that you won – whether prep wise or in the mental game? What does this one mean to you that the other ones might not have meant? Khan: Yeah. This one does mean a lot to me. Because it’s another big chance again. A fight at the Garden. Fighting at such a big arena. I’ve always wanted to fight at the Garden. I’ve fought at the smaller venue but not in the Garden. I love New York. I love to give my fans extremely big fights. This is yet again another big fight for them. If you think of the last 10 years, it’s been a mixture of big fights. I’ve been in big fights, title fights, big fights with big names. It’s a great way for me to have the opportunity to fight for another world title and hopefully to become a world champion at 147 pounds, where I’m unbeaten. It’s a weight division where I’m very comfortable. I like this weight division. I feel strong at this weight division. Really, I’ve got no excuses. As this fight plays out I know I’m going to be in the best shape ever. BoxingScene.com: Terence has had big fights. But this one feels bigger. He’s in New York and headlining a show with a big-name opponent. Do you have any sort of advantage because you’ve been through this sort of thing before, or is it even ground for both of you? Khan: I’ve been through this before and I know how to deal with everything. It’s a first time for him. For him, I think there’ll be a lot of pressure. I’ve done this before. I’ve been through this. I’ve been in the same shoes as Terence Crawford before. I’m sure he’s a true professional. He’s a true fighter. And he’s says he’s not gonna let this occasion get to him. But I feel like I do have the upper hand because I’ve been through this. BoxingScene.com: Specifically, what advantage does a veteran have when it comes to the big-fight experience and atmosphere? What is the edge that someone who’s been through it actually has? Khan: You know how to deal with the pressure. You know how to deal with the nerves. I had to deal with everything around, like the surroundings, the weigh-ins. Before a big fight the weigh-ins are a bit different. The press conferences are a little different. There’s a lot of media stuff going on as well. Making sure you do all that and take the time for it. Sometimes it can get a little bit overwhelming. But it’s all about just knowing how to deal with things and staying calm and having the right team around you. BoxingScene.com: You’ve been at this awhile. You know you’re the underdog. You know people expect him to win. When you think about those people and their predictions, what is it that they’re missing? Are they overvaluing him? Are they undervaluing you? What is it that they’re missing when they say “Crawford wins this fight easily”? Khan: I think they’re definitely overvaluing him, obviously, looking at the level of opponents he’s fought. Look at the caliber of opponents. I’m on a different level, really, the way I’ve fought different guys and I’ve jumped up weight to fight people and taken big risks and big fights. I don’t think he’s took any risks yet. I feel like they’re going to always doubt me, they’re always going to say I don’t have a chance. But really there’s only a year difference in our ages. He’s 31, I’m 32. I’m at the peak of my career now. I feel as strong as I’ve ever been. I feel quicker than ever. They’re gonna always put me down in ways and say he’s a better fighter. But we’re not gonna know until the fight happens on April 20. Obviously people are going with whatever his record says because he’s unbeaten and I’ve had a few losses. People are always gonna stay with the unbeaten fighter. But the level of opponents he’s fought are nowhere near as good as mine. BoxingScene.com: You haven’t lost at 147 pounds. Is that the thing that people aren’t seeing, that this is your ideal weight? How big a deal is that to you, to fight him at 147 and be comfortable? Khan: To me it’s a big deal. It’s more my natural weight. I’m happy making this weight. I have fun making this weight. I’m going to be happy in the fight. I’m glad the fight’s at this weight. I’m just going to go in there and go with the flow really and do what I do best. I’ve got my advantages, which is I like the weight the fight’s made at. I’ve got the speed and the skill at this weight. I won’t be carrying too much excess weight. I’m just going to go in there and do what I need to do. I think what people don’t realize is that they’re looking at Crawford’s unbeaten record, but Crawford is new in this weight division and this is his first big test really. I’ve been in this weight division as well. So let’s see how it all plays out. He’s never really fought anyone with the hand speed and the power I have, or the movement. Someone who can box and fight. I’m not just going to try to get in there and score big shots. I can box him and fight him. He’s quite new in this division and I am going to catch him by surprise a few times. BoxingScene.com: It’s April 20, we’re settling in for the first few rounds. What are we going to see – what are the people who picked against you going to see – that makes them think Amir has got a real chance to win this? How are we going to be able to tell that in the first one, two or three rounds? Khan: You’re going to see me catch him with some shots. You’re going to see me catch him quite cleanly with some shots. And you’re going to see the difference between us in the size and power and the skills. I’ve been in the ring like this many times before. So they’re going to realize I’m that guy and they’re going to realize, all right, you do have a chance. No legit title fights scheduled. NOTE: Fights previewed are only those involving a sanctioning body’s full-fledged title-holder – no interim, diamond, silver, etc. Fights for WBA “world championships” are only included if no “super champion” exists in the weight class.